Where do you want this one? Ray loves Christmas. He loves decorating. He loves trimming the tree. He loves getting presents. And he loves shopping (but only for himself). So I knew that when I started decorating the tree that it was going to be a problem. As we did last year, we put the tree up in the front hall. I started decorating Sunday night while Ray slept on the couch and Gregg cooked dinner, but I didn't quite finish. So this morning, after a trip to the frozen tundra that is the dog park, I continued with my tree-trimming and decorating. Like last year, I was hanging the glass ornaments high and the 'other' ornaments low. I didn't think Ray was stupid enough to eat another glass ornament but I didn't want to take any chances. As I was trimming the tree, it became obvious pretty quickly that Ray was determined to help. 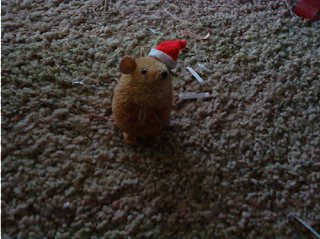 He was particularly taken with a santa mouse ornament made of something organic. 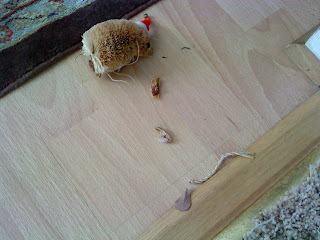 I decided that, instead of taking it away from him every ten seconds, the mouse was going to have to take a bullet for the team. 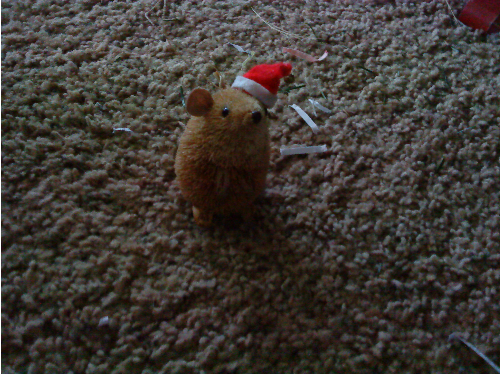 So while Ray was 'occupied' with the mousie, I continued with decorating the tree. Unfortunately, his interest lasted only as long as it took to dismember the poor little thing. Then he moved on to other ornaments. Still, he didn't keep me more than marginally occupied with curbing his more enthusiastic foraging into the lower tree branches, and I was able to finish the tree-trimming. 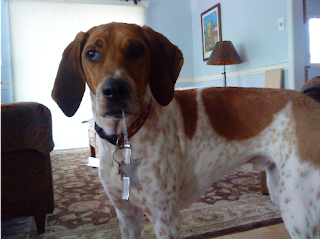 I took the dismembered mouse, fixed the hangy thing so that I could put him back on the tree within nose range of the hound, and hung him back up. 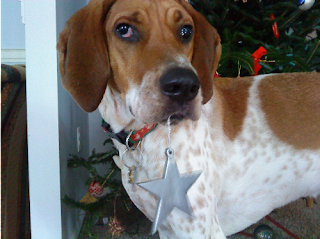 Throughout the day, every time I passed the tree, I had to rehang the mangled mousie. Obviously, a fave of Ray the blind dog. 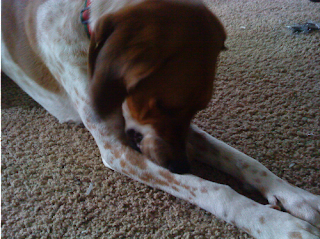 He's not praying, he's dismembering. The aftermath. Two feet, a tail, and an ear.